annotations: a list of metadata that provides further direction to other parts of Kubernetes on how to treat the Ingress. You set the Ingress Controller to nginx, the Let’s Encrypt cluster issuer to the production variant (letsencrypt-prod), and tell the nginx controller to accept files with a max size of 30 GB, which is a sensible limit for even the largest Docker images. tls: this subcategory configures Let’s Encrypt HTTPS. You populate the hosts list that defines from which secure hosts this Ingress will accept HTTPS traffic with our example domain name. In the next block, secrets, you configure keys for accessing your DigitalOcean Space under the s3 subcategory. Finally, in the s3 block, you configure the parameters specifying your Space. Now, if you haven’t already done so, set up your A records to point to the Load Balancer you created as part of the Nginx Ingress Controller installation in the prerequisite tutorial. To see how to set your DNS on DigitalOcean, see How to Manage DNS Records. Next, ensure your Space isn’t empty. 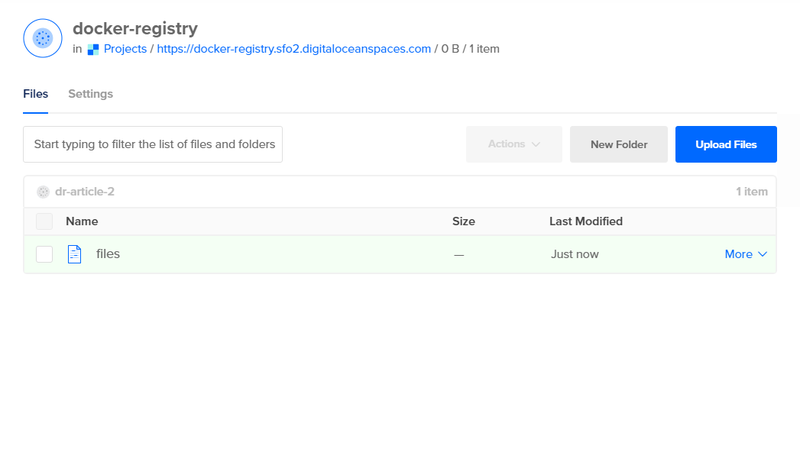 The Docker registry won’t run at all if you don’t have any files in your Space. To get around this, upload a file. Navigate to the Spaces tab, find your Space, click the Upload File button, and upload any file you’d like. You could upload the configuration file you just created. You’ve configured and deployed a Docker registry on your Kubernetes cluster. Next, you will test the availability of the newly deployed Docker registry. In this step, you’ll test your newly deployed Docker registry by pushing and pulling images to and from it. Currently, the registry is empty. To have something to push, you need to have an image available on the machine you’re working from. Let’s use the mysql Docker image. You’ll see output listing the images available on your local machine, along with their ID and date of creation. Your Docker registry is configured. You’ve pushed an image to it and verified you can pull it down. Now let’s add authentication so only certain people can access the code. In this step, you’ll set up username and password authentication for the registry using the htpasswd utility. To add authentication to your Docker registry, you’ll need to edit chart_values.yaml and add the contents of htpasswd_file in the htpasswd variable. Once you’ve added your contents, save and close the file. You’ve used htpasswd to create a login config file, configured the registry to authenticate requests, and created a Kubernetes secret containing the login credentials. Next, you will test the integration between your Kubernetes cluster and registry. 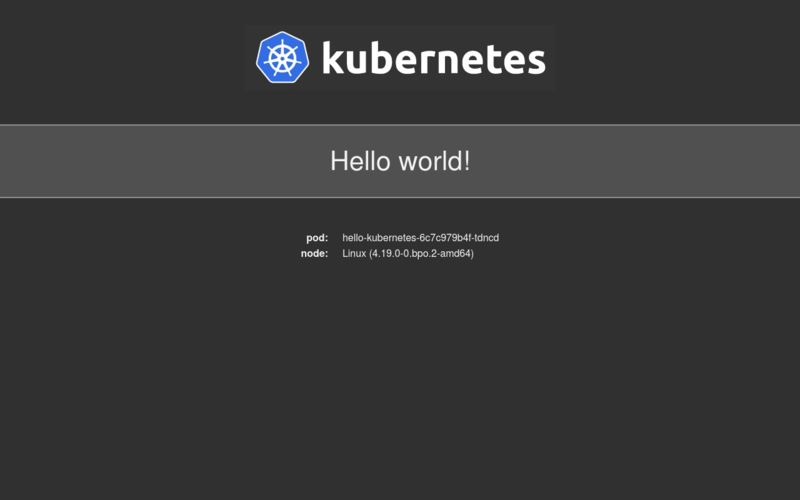 In this step, you’ll run a sample deployment with an image stored in the in-cluster registry to test the connection between your Kubernetes cluster and registry. In the last step, you created a secret, called regcred, containing login credentials for your private registry. It may contain login credentials for multiple registries, in which case you’ll have to update the Secret accordingly. The Hello World page lists some environment information, like the Linux kernel version and the internal ID of the pod the request was served from. You can also access your Space via the web interface to see the images you’ve worked with in this tutorial. You’ve created a sample Hello World deployment to test if Kubernetes is properly pulling images from your private registry. Solid advice! Keep your Django templates and views clean by moving application logic into model methods and model managers. In this step-by-step Python tutorial, you’ll get a solid understanding of the limitations of Django migrations by tackling a well known problem: creating an index in Django without downtime. I’ll be there, the Real Python team will be there, and so will Mike Kennedy from Talk Python, Brian Okken from Test & Code, Matt Harrison, the PyBites team, Chris Medina, and Miguel Grinberg. Be sure to stop by and say hi 🙂 Thanks JetBrains! Taking a closer look at Python’s built-in list sorting methods with regards to memory consumption and time efficiency. Nice writeup! Apply today to see what job opportunities are waiting for you! Learn the four main approaches to string formatting in Python, as well as their strengths and weaknesses. You’ll also get a simple rule of thumb for how to pick the best general purpose string formatting approach in your own programs. Short & sweet intro to the calendar module in the Python standard library. How to create a simple, internal CA for your microservice architecture or integration testing—with Python. In this step-by-step tutorial, you’ll get started with linear regression in Python. Linear regression is one of the fundamental statistical and machine learning techniques, and Python is a popular choice for machine learning. An example of using TensorFlow for Human Activity Recognition (HAR) on a smartphone data set in order to classify types of movement, e.g. “walking”, “sitting”, “standing” etc. In this part of Jahongir’s blog post series you’ll see how to expand your web framework with custom exception handlers, support for static files, and middleware processing. Want to learn Python? What better way to learn than by having a Game of Thrones project to complete as motivation. Imaging, analysis, and simulation software for radio interferometry used for generating the famous black hole image. Python FTW! This was PyCoder’s Weekly Issue #364. Python has an built-in module named Calendar that contains useful classes and functions to support a variety of calendar operations. By default, the Calendar module follows the Gregorian calendar, where Monday is the first day (0) of the week and Sunday is the last day of the week (6). In Python, datetime and time modules also provide low-level calendar-related functionalities. In addition to these modules, the Calendar module provides essential functions related to displaying and manipulating calendars. To print and manipulate calendars, the Calendar module has 3 important classes: Calendar, TextCalendar, and HTMLCalendar. In this article, we will see how these classes can help implement a variety of calendar related functions. Let’s take a look at the list of useful functions in this module. The above function returns the calendar for the entire year, for the year specified as an argument. The arguments passed to this function are the year (yyyy), date column width (w), number of lines per week (l), number of spaces between month’s column (c), number of columns (m). Note: Instead of using “print”, we can alternately use calendar.prmonth() and calendar.pryear() functions to print the month and year calendars. These functions print the output on your terminal. The arguments passed to the function are 2 valid year values. This function returns the number of leap years between those years. As seen, there are 5 leap years between 2000 and 2017, hence the output is 5. As seen, this function returns index value “3”, which is “Thursday”. The function weekheader takes an argument n, which specifies the number of characters for a particular weekday name and returns a header containing abbreviated weekday names. The monthrange function takes 2 arguments: year and month. This function returns a tuple containing the index of the day of the week in which the month starts and the number of days in the month. Since the first day of December, 1983 was a Thursday, the function returns index value of Thursday as the first element of the tuple, and 31 since that is the number of days in December. The monthcalendar function takes 2 arguments: year and month and returns a matrix, in which each row represents a week in that month. As you can see, each week array begins with Monday and days outside of the month are represented with zeroes. So the first array indicates that the first day of the month is a Tuesday. Default calendar settings can be modified to fit your needs. For example, the following script sets Monday as the first day of the week. By default, calendars follow European convention, having Monday as the first day of the week and Sunday as the last day of the week. Also, the month January has the index value 1 and December has the index value 12. The following are some of the most useful methods of the calendar class. This method returns an iterator that contains a list of indexes for the days in a week. The itermonthdates() takes 2 arguments: year and month. This function returns an iterator of all days of the given month. Also, all days before the start of the month and after the end of the month, required to get the complete week, are displayed. This method is similar to itermonthdates method, but it only returns the day numbers. As you can see, all days before the start of the month and after the end of the month to get the complete week are set to “0”. This method displays a tuple consisting of day and weekday numbers. This method is pretty similar to the itermonthdays3() method, except that it returns a tuple of year, month, and the day of the month. This method takes year and month as arguments and returns a list of full weeks in the month. Each week is a list of 7 datetime.date objects. This function takes year and month as arguments and returns a list of weeks, with each week as 7 tuples of the day of month and day of the week. This method takes year and month as arguments and returns a list of full weeks, with each week being a list of days of a month. This function takes the year (yyyy) and the number of months in a month row (w). By default, w parameter is 3. The function returns a list of month rows, where days are datetime.date objects. This function takes the year (yyyy) and number of months we want in a month row (w). By default, the w parameter is 3. The function returns a list of weeks, as tuples of days of the month and the day of the week. This function takes the year (yyyy) and the number of months we want in a month row (w). By default, w parameter is 3. The function returns a list of weeks as the day of the month. The TextCalendar is used to generate plain text calendars. Similar to the Calendar class. This class takes a constructor where the first weekday is set to 0, by default. Let’s look at the methods provided by the TextCalendar class. This method takes 4 arguments namely: year, month, the width of days column (w), and a number of lines used by each week (l). This method returns a multi-line string. This displays calendar of January, 2019. This method prints a month’s calendar as returned by the formatmonth method. We can use this function to avoid the use of “print” function, to print the calendar on the terminal. This method returns a “m” column calendar for the entire year. The arguments passed to this function are year (yyyy), date column width (w), number of lines per week (l), number of spaces between month’s column (c), number of columns (m). This will print the name of the months, as per the local system. This is similar to TextCalendar class, but, generates an HTML calendar. The constructor for this class has the firstweekday set to “0”. Below are some of the methods provided by the HTMLCalendar class. The HTMLCalendar output looks similar to the plain text version, but it is wrapped with HTML tags. The cell of the HTML table contains a class attribute corresponding to the day of the week. Therefore, the HTML calendar can be styled through CSS. In this tutorial, we discussed the use of different classes and sub-classes of Calendar module in Python for working with dates to manage week/month/year oriented values. We also discussed the use of functions in the Python Calendar module. Along with this, we also implemented the TextCalendar and HTMLCalendar classes to produce pre-formatted output. I hope the tutorial was informative! You can find this video and the other recorded presentations in the MacADUK 2019 playlist on YouTube. I am really happy with how this presentation turned out and I could be more happy with the keyframe that was chosen for the video. You can find the notes and slides at the session’s permanent page. Many thanks again to all those who put a lot of effort into making MacADUK 2019 the great conference it was. Also thanks to the attendees with all their great feedback and applause. See you all again next year!